CORRECT-A-STEP Custom Fit Orthotics have brought pain relief and walking comfort to over 100,000 people during the last 30+ years. Our full line of products are built with the highest quality engineering and design, using the most resilient materials and are designed to maintain their shape and functionality even under the toughest conditions. We back that statement up with a 5 year “Free Replacement” warranty against breakage. Your feet provide the foundation for how you walk and how you stand. If the foundation has problems, everything else is affected… your legs, your back, your stride, and your posture. CORRECT-A-STEP’s full line of orthotics are designed to properly support your foundation and provide relief that affects so many areas of your body. Our 30+ years experience has taught us many things, but one of the most important lessons has been that if you offer only the best product of it’s kind, made from the best materials available, you can never go wrong. We have always strived to sell only the best products and that is how we have built our reputation, one sale at a time. Watch as these twins try on our Slimline Orthotic and by correcting their posture, inches are added to their height instantly. In this video you can see the dramatic change in posture by simply stepping onto a pair of our Slimline Orthotics. 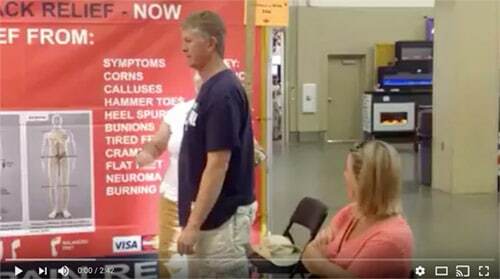 This short two minute video shows the before and after arm strength and posture of a customer test driving our Advanced Stabilizers. What is the difference between the Advanced Stabilizers and the Thinthotic? Good question! The Advanced Stabilizer is designed with a deep cupped heel and high flanges. It is best used when you roll inward. This is called pronation. It is also used with someone that has high arches and rolls outward. This is called Supination. The deep cupped heel and the high flanges on each side cradle the foot and help to stabilize the natural arches of your feet. The Thinthotic is semi-flexible and does not offer as much control and a bit less metatarsal support. It’s design being thin wears wonderfully in dress shoes and western boots. It is a professional call as to which one we place you in. How long before I will be wearing my new orthotic all day comfortably? Everyone is different. Depending on your individual problems and interestingly enough your gender. Men take longer to adjust then women. It also depends on if you have been wearing an insert and how long you have had it. Best case scenario is 3 to 5 days and worst case, 10 days to 3 weeks. How long before they wear out? The material used to manufacture both the Advanced Stabilizer and the Thinthotic is of the highest quality. We are very comfortable telling you that they will last 12-15 years. Although we recommend replacing them every 7-10 years. Remember, you are not the same person today that you were 7 to 10 years ago. Will they help my hurting heels? It has been our experience in 30 years of business that either of these two inserts takes pressure from your heels and allows you to walk in comfort. Will they help my hurting knees or hips? Again, it has been our experience that when the arches of your feet are supported it alleviates the discomfort that you are experiencing in your knees and hips. Do you have any testimonial letters? A very good questing indeed! We have lots and lots of testimonial letters! And will share them upon request. 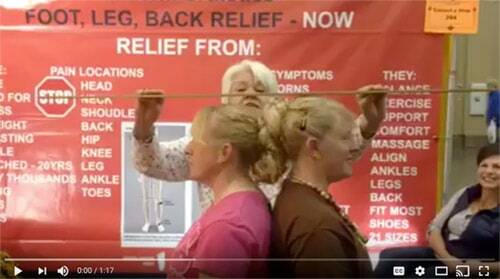 IF YOU WATCH OUR VIDEO’S YOU CAN LITERALLY SEE HOW INDIVIDUAL’S BALANCE AND POSTURE ARE IMPROVED WHEN THE ADVANCED STABILIZERS OR THE THINTHOTIC ARE PLACED UNDER THEIR FEET.